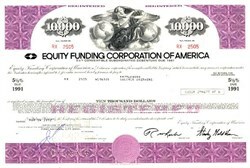 Beautifully engraved Certificate from the infamous Equity Funding Corporation of America issued in the 1970's. This historic document was printed by the Security Columbian Banknote Company and has an ornate border around it with a vignette of an angelic allegorical woman flanked by two worlds. The certificate has the printed signatures of the company's officers, including the infamous Stanley Goldblum as President.